Robot & Frank is the story of a friendship between man and robot. 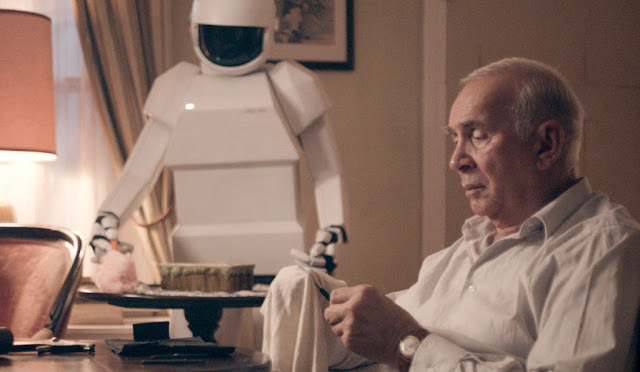 It sounds a bit silly in synopsis; retired jewel thief Frank (Frank Langella) is given a carer robot by his concerned son. After his initial dislike of the nannying robot, the elderly man realises he can train the robot to help him revive his career as an expert cat burglar. But Robot & Frank quickly reveals a surprising amount of depth and sensitivity as it negotiates some timely and unique territory. We’re presented with a believable ‘just around the corner’ future. There’s no flying cars, holograms or lifelike androids, but we witness the final stages of an old, familiar analogue world being comprehensively cleared away once and for all for a shiny new digital age. Though we see thin, transparent smart-phones and advanced tablets, the most advanced piece of technology in the film is the titular Robot (acted by Rachael Ma and voiced by Peter Saarsgaard), who remains unnamed. He’s patterned after Honda’s famous ASIMO robot, and moves smoothly with an unnerving whir of actuators and a spooky HAL-9000 voice. Robot straddles the fence between personhood and appliance. Exploring whether an artificial human being has a soul is a question that’s propelled many great films in cinema history, from Fritz Lang’s Metropolis, through to Blade Runner and Terminator 2: Judgement Day. Interestingly, Robot & Frank subverts the question slightly: Robot repeatedly asserts that he’s not a human being, considering himself a piece of equipment. As events develop, Frank realises that the contents of Robot’s memory could be used as evidence of his criminal activities, and must wrestle with whether to wipe the memory of someone he considers his friend, or face the legal consequences of his actions. In a further subversion of what you’d expect an Asimov-like ‘robot’ film to be about, Robot repeatedly urges him to do it - he attaches no importance to his memory. Robot & Frank deals with memory in multiple ways. The first and most prominent is Frank’s dementia. As the film opens we sympathise with Frank, as far as we can see he seems perfectly capable of living on his own. Sure his house is a bit of mess, but it’s easy to write this off as a sign of an eccentric personality rather than a symptom of an underlying serious medical issue. But as the film goes on he has increasingly serious lapses in memory, ranging from not realising his favourite restaurant went out of business years ago, to forgetting who his children are. This deterioration in Frank’s memory is mirrored through the changes happening at his local library. The library, run by the geek-cute Jennifer (Susan Sarandon) is in the process of being converted into a community centre. The dusty books, looking increasingly tatty and damaged are being scanned into a digital database and subsequently destroyed. As Jennifer perceptively says, “when you can access any book in the world in a few seconds, what’s the point of a physical library?”. To some extent the film views this change as a loss, making a point of fetishising the tactile qualities of print and having Frank comment that a room full of people scanning and destroying books “feels like Nazi Germany”. Yet, at the same time it feels like an inevitable change, and at least the communal space of the library is being preserved. The digitisation of the books also reflects the way in which Frank increasingly comes to rely on Robot as a surrogate memory. There are scenes where Frank relays his life experiences to Robot, explaining his justifications for the way he’s lived his life, explaining the conclusions he’s reached over the course of his life and confessing his sins. Much like what’s happening at the library, Frank is digitising his memories as his analogue mind deteriorates. This makes the worth of Robot’s memory much more important to Frank. If he chooses to wipe Robot’s memory, he is consciously deleting a large part of himself, as well as losing a friend. This melds seamlessly into the further issues the film explores, the growing symbiosis between man and technology. No moral judgment is made on whether this relationship is positive or negative, just that the increasing reliance of people on technology is an inevitability. Whilst living with a walking, talking robot is science fiction at the moment (although probably not for long) we already rely on technology as a substitute for a lot of brainpower. My smartphone wakes me up in the mornings, lets me know I have to do today, remembers who my friends are and how to get in touch with them and lets me access whatever information I need at the touch of a fingertip. If it could walk around it would be much like Robot. Part of what makes Robot & Frank so satisfying is that it examines this relationship between man and machine from the viewpoint of someone that is relatable because he’s old rather than in spite of it. It’s surprisingly rare to find a film set in the future where the protagonist could be us in 20 or 30 years (the only other example I can think of that sort of fits is Children of Men). While the year the film takes place in is undefined, it’s easy to identify with his annoyance at the changes taking place in the world, and the unwanted intrusion of technology into his life. It’s also a great way to get you to sympathise with an older character. In one scene at a party, there’s an electronic orchestra playing very strange, out of tune music. Frank screws up his face when he hears it, and so do we - it sounds terrible. At that moment you realise you’re pre-emptively behaving like a boring old git, moaning about how music used to be better “back in the day”. 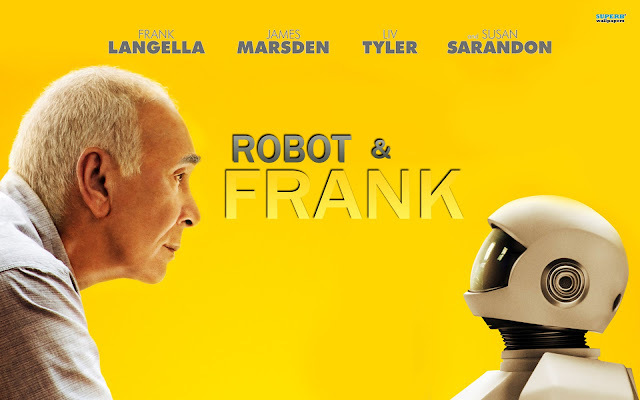 Robot & Frank is a thoughtful, intelligent and cleverly layered film with a lot of interesting points to make. Aside from this, it’s also damn funny, especially in the opening scenes as a grumpy Frank is suspicious and resentful of his bossy robot nurse. Though the tone is pretty light-hearted for the majority of the film, we’re invested enough in the characters that we take the stakes seriously. Both Langella and the two actors playing Robot do a great job in ensuring that we quickly like this slightly creepy looking figure. My only criticisms would be that certain developments late in the plot are a bit melodramatic, and that there is a subplot that peters out without resolution. But aside from this, Robot & Frank takes a high concept and deals with it thoroughly and confidently, showing us a science fiction future that will soon become another mundane present.